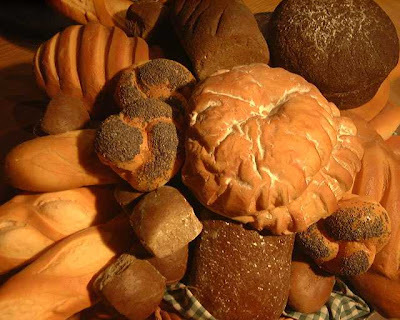 The next bread I'm featuring is a recipe for French Bread. 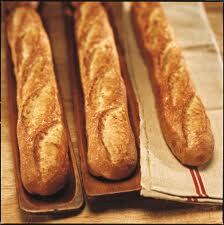 A good French baguette will have a very crispy crust and chewy center, as well as long and thin in shape. The French are known for their baking prowess and I have to admit I was very skeptical that I could bake and "edible" loaf. Surprisingly, it's quite simple. The biggest difference I found in preparing this versus other breads that I'm comfortable (like Challah), is that you have to roll the dough, jelly roll style, before it's second rise. Flour (all purpose) and yeast in bowl of my stand mixer. Add about 1 tablespoon of oil to a bowl so that your dough won't stick to it. A well kneaded, smooth dough. After taking the dough out of the mixing bowl, I decided that it was still too sticky. I added flour, 1 tablespoon at a time, while kneading by hand to get the right consistency. Your dough should be soft but not stick to your hands. This takes practice and experience to know how it should "feel." The recipe won't always be exact. The amounts of fluids and flour will depend on your brand of flour. Some flours soak up liquids while others don't. Remember the bowl with the oil? I did a little dough gymnastics to get the ball covered with oil. Just plop your ball o' dough into the bowl on top of your drop of oil and flip it over. I turn it a couple times to ensure the dough is covered with oil. Believe me, this step is important! The rolling of the dough. When you've rolled this much use your fingers or a pastry brush dipped in water and brush the loose end. Then finish rolling and seal. Cut 4-5 diagonal slits in the top. Unfortunately I have no more pictures. The ol' brain blipped and I forgot to take pics of the finished product. In a large bowl, combine 2 cups flour, yeast and salt. Stir in 2 cups warm water, butter and honey and beat until well blended using a stand mixer with a dough hook attachment. Using a wooden spoon, stir in as much of the remaining flour as you can. Punch dough down, and divide in half. Turn out onto a lightly floured surface. Cover, and let rest for 10 minutes. Roll each half into large rectangle. Roll up, starting from a long side. Moisten edge with water and seal. Taper ends. Grease a large baking sheet. Sprinkle with cornmeal. Place loaves, seam side down, on the prepared baking sheet. Lightly beat the egg white with 1 tablespoon of water, and brush on. Cover with a damp cloth. Let rise until nearly doubled, 35 to 40 minutes. With a very sharp knife, make 3 or 4 diagonal cuts about 1/4 inch deep across top of each loaf. Bake in a preheated 375 degrees F (190 degrees C) oven for 20 minutes. Brush again with egg white mixture. Bake for an additional 15 to 20 minutes, or until bread tests done. If necessary, cover loosely with foil to prevent over browning. Remove from baking sheet, and cool on a wire rack. Oh my God! They look delicious... I didn't know we put honey in Baguette? I'm looking forward to trying it very soon and I'll post back my review on the results!